This was the first major UK performance buy the “Who 2”. It was preceded by three warm-up gigs at the London Forum. 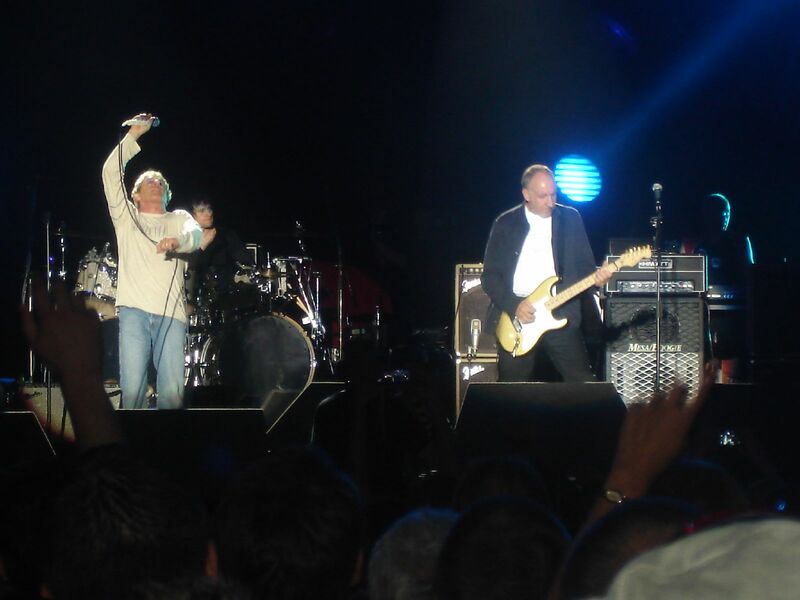 The line-up was Roger Daltrey and Pete Townshend accompanied by Rabbit Bundrick on keyboards, Pino Palladino on bass, Zak Starkey (Ringo’s son) on drums and Simon Townshend (Pete’s younger brother) on guitars and backing vocals. 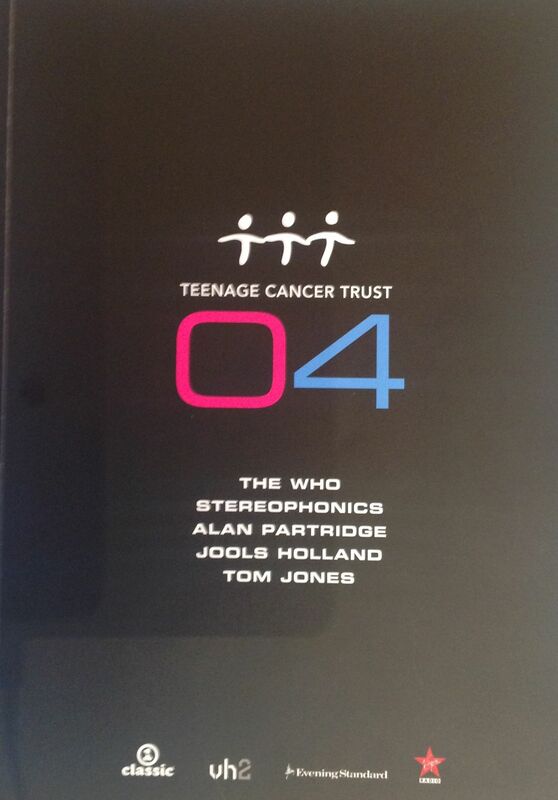 The concert, which was part of a run of shows in support of the Teenage Cancer Trust for which Roger was Chair at the time, was originally announced as a performance of “Tommy”, but for some reason that never came to be, and what was actually performed was a set of Who classics. Support came from Liverpool psych mod band The Coral, who were excellent. I went to the concert with David. This was the first time I’d been to the Albert Hall, and we stayed in a hotel close to the venue. We had quite good seats, close to the stage, on Pete’s (right hand) side. Roger had a terrible cold and as a result he was singing in an ultra raspy voice. You could see that it was hurting him when he sang. Pete wore black wrap around visor sunglasses for the first couple of songs, which made him look pretty moody. They premiered two new songs “Real Good Looking Boy” and “Old Red Wine”. It was great to see The Who in full flight again. It is unfair to attempt to draw comparisons between the current Who 2 and the 1970s Who. Of course, it is a different band, and it is impossible to recreate past performances. I am grateful that I can still go to a Who concert, and see Roger and Pete play those classic songs. We got up very early to catch a train at 6am so I could get back up north and go to work. Encore: Pinball Wizard; Amazing Journey; Sparks; See Me Feel Me. The next time I saw the Who was at Live 8 in Hyde Park. They played a short two song set of “Who Are You” and “Won’t Get Fooled Again”, sandwiched between Robbie Williams and the reunited Pink Floyd and were introduced by Peter Kay 🙂 I need to blog about Live 8 on another day. Tomorrow I’ll move to a Who performance in 2006 at the O2 Wireless Festival, Harewood House, Leeds, 2006. This was The Artic Monkey’s big gig, and sold out in amazing time, with a second night being added immediately to satisfy demand for tickets. The Artic Monkeys had come from nowhere, and were suddenly all over the place and massive. I hadn’t heard anything by them, but David and Laura fancied going so I bought tickets as soon as they went on sale. I’m glad I did, as this was a great gig. We drove down and arrived just in time to see The Coral. David and I had already seen them supporting The Who at the Albert Hall a year or so before. Their very 60sish blend of jangling guitar, folk-rock, and psych is exactly the sort of thing I like. They went down well with the crowd, but the sound mix was pretty poor. Supergrass came on and really rocked, and were a bit of a pleasant surprise to me. Much more rockier than I expected; reminded me of Steve Marriott and Humble Pie. Any Winehouse was just great, and also went down well with the crowd. The Cricket Ground is a massive venue and it was absolutely packed by the time The Artic Monkeys took to the stage. The reception was unlike anything I’d seen for some time. The whole crowd sang along with every word, and went absolutely mental, with beer (or was it piss?) flying everywhere. By the day of the gig Laura had bought the album and I knew some of the songs, particularly I Bet You Look Good On The Dancefloor, Mardy Bum and When the Sun Goes Down. We all sang along, and had a great time. Stayed the night in a hotel which was walking distance away and drove back in the morning. Setlist: Fluorescent Adolescent; I Bet You Look Good On The Dancefloor; Brianstorm; Still Take You Home; Dancing Shoes; From the Ritz to the Rubble; Fake Tales of San Francisco; Balaclava; Old Yellow Bricks; You Probably Couldn’t See for the Lights But You Were Staring Straight at Me; This House Is a Circus; Teddy Picker; D Is for Dangerous; If You Were There, Beware; Mardy Bum; Do Me A Favour; The View from the Afternoon; When the Sun Goes Down; Leave Before the Lights Come On; Encore: Plastic Tramp; 505; A Certain Romance. Other memories: massive queues for the toilets; getting charged twice by the hotel somehow and having to contact them afterwards for a refund, which eventually got sorted out. Forgot to mention the first support who were The Parrotts and are a Beatles tribute act from Japan (honest!). I think the Artic Monkeys had seen them on their travels and were impressed by them. I thought we might have caught part of their set, but David and Laura both don’t recall seeing them at all. Who knows.